I ventured to the north Meath/Cavan region recently where I visited Crossdrum House — a lovely Georgian home on 35ac on the outskirts of Oldcastle in Meath. It comes with a working yard made up of traditional and modern buildings on parkland that includes wooded areas and grazing ground recently fenced for sheep. The private treaty sale is guided at €950,000. 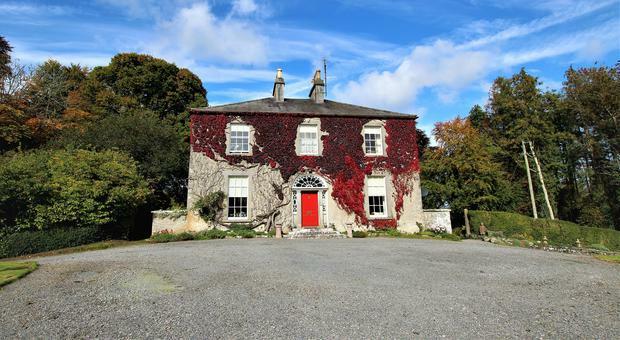 Located about 4km from Oldcastle, off the Castlepollard Road, the property is accessed by an attractive stone gateway and a long avenue that leads through rows of specimen trees. The avenue divides in two, with one branch sweeping around to the house and the other by the side of the residence to the yard. Selling agent Hugh Morris of Alliance Auctioneers, Kells, is waiting in the kitchen with the owner. The place was bought by the current incumbents about three years ago, having sold their original sheep farm in North Dublin. The ever-expanding outer suburbs of the capital made it increasingly difficult to farm, so they sold up and bought at Crossdrum, where they continued to farm on a much smaller scale. A back injury sustained during the lambing season means that active farming is no longer possible, so they are very reluctantly selling. The house is a fine two-storey over-basement residence that comes with all the refinements of Georgian living, including spacious reception rooms, ornate plasterwork, an Adams fanlight over the main door, sash windows with shutters and spacious, light-filled bedrooms. The house is in very good condition, comfortable and perfectly habitable. Any new owner could move in and live happily in the house for a few years before adding their own personal touches. Georgian outhouses and sheds used for sheep handling, shearing, lambing and feed storage. Farm buildings include two three-column round roofed sheds and one four-column shed, an old cubicle house, and a disused milking parlour complete with milking pit. A new four-column A-roof shed can be used for many purposes, including lambing, holding pens and for storage of fodder or machinery. The sheds are mainly in very good condition, especially the new-builds, while others have been cleaned up, painted and re-roofed by the current owner. More are in the process of being renovated. There is a wide range of stock-handling facilities on the farm. The gardens are delightful and traditional in layout, with pathways through the beds, a small stream with a waterwheel and an array of plants and shrubs as well as an orchard. The current owner has a great regard for trees and aside from one acre in hardwoods, all single stands in the open parkland are surrounded by fencing to protect them from adventurous sheep. 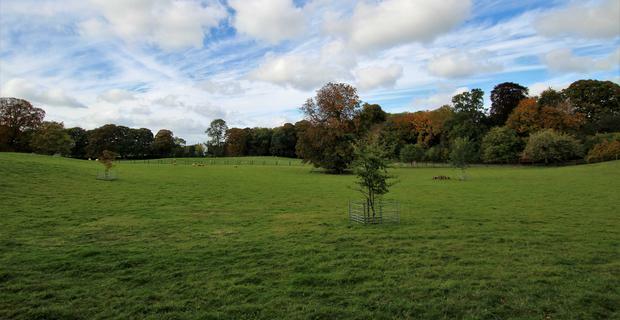 The land is in a number of paddocks in great heart and fenced with top-of-the-range stock-proof fencing. An additional 18ac located 1km from the main farm is also available for sale. Divided by a local road, this parcel has 4ac at one side that could have site potential subject to planning permission and 14ac of farmland at the other side. The place is for sale by private treaty and Hugh Morris expects a wide range of interest, “This is a beautiful property with loads of potential from a private residential, farming or tourism perspective. The farm is in the shadow of Loughcrew and its megalithic tombs, and an hour from Dublin,” he said.